A previous version of this tutorial was written by Sergey Zhukaev. Nginx is a fast and reliable open-source web server. It gained its popularity due to its low memory footprint, high scalability, ease of configuration, and support for a wide variety of protocols. HTTP/2 is a new version of the Hypertext Transport Protocol, which is used on the Web to deliver pages from server to browser. HTTP/2 is the first major update of HTTP in almost two decades: HTTP1.1 was introduced to the public back in 1999 when webpages were usually just a single HTML file with inline CSS stylesheet. The Internet has dramatically changed since then, and now we are facing the limitations of HTTP 1.1 — the protocol limits potential transfer speeds for most modern websites because it downloads parts of a page in a queue (the previous part must download completely before the download of the next part begins), and an average modern webpage requires about 100 request to be downloaded (each request is a picture, js file, css file, etc). Even though HTTP/2 does not require encryption, developers of two most popular browsers, Google Chrome and Mozilla Firefox, stated that for the security reasons they will support HTTP/2 only for HTTPS connections. Hence, if you decide to set up servers with HTTP/2 support, you must also secure them with HTTPS. This tutorial will help you set up a fast and secure Nginx server with HTTP/2 support. Nginx installed on your server, which you can do by following How To Install Nginx on Ubuntu 18.04. A domain name configured to point to your server. You can purchase one on Namecheap or get one for free on Freenom. You can learn how to point domains to DigitalOcean Droplets by following the How To Set Up a Host Name with DigitalOcean tutorial. You can get a free certificate from Let's Encrypt by following How to Secure Nginx with Let's Encrypt on Ubuntu 18.04. You can also generate and configure a self-signed certificate by following How to Create a Self-signed SSL Certificate for Nginx in Ubuntu 18.04. You can buy one from another provider and configure Nginx to use it by following Steps 2 through 6 of How to Create a Self-signed SSL Certificate for Nginx in Ubuntu 18.04. Nginx configured to redirect traffic from port 80 to port 443, which should be covered by the previous prerequisites. Nginx configured to use a 2048-bit or higher Ephemeral Diffie-Hellman (DHE) key, which should also be covered by the previous prerequisites. If you followed the server block set up step in the Nginx installation tutorial, you should have a server block for your domain at /etc/nginx/sites-available/your_domain with the server_namedirective already set appropriately. The first change we will make will be to modify your domain's server block to use HTTP/2. The first one is for IPv6 connections. The second one is for all IPv4 connections. We will enable HTTP/2 for both. This tells Nginx to use HTTP/2 with supported browsers. Save the configuration file and edit the text editor. Next, we'll configure our server to use a more restrictive list of ciphers. HTTP/2 has a blacklist of old and insecure ciphers, so we must avoid them. Cipher suites are cryptographic algorithms that describe how the transferred data should be encrypted. The method you'll use to define the ciphers depends on how you've configured your TLS/SSL certificates for Nginx. If you used Certbot to obtain your certificates, it also created the file /etc/letsencrypt/options-ssl-nginx.conf which contains ciphers which aren't strong enough for HTTP/2. Modifying this file will unfortunately prevent Certbot from applying updates in the future, so we'll just tell Nginx not to use this file and we'll specify our own list of ciphers. If you see any errors, address them and test again. With the server restarted, let's verify that it works. Let's ensure the server is running and working with HTTP/2. You can also verify that HTTP/2 is in use in Google Chrome. Open Chrome and navigate to http://your_domain. 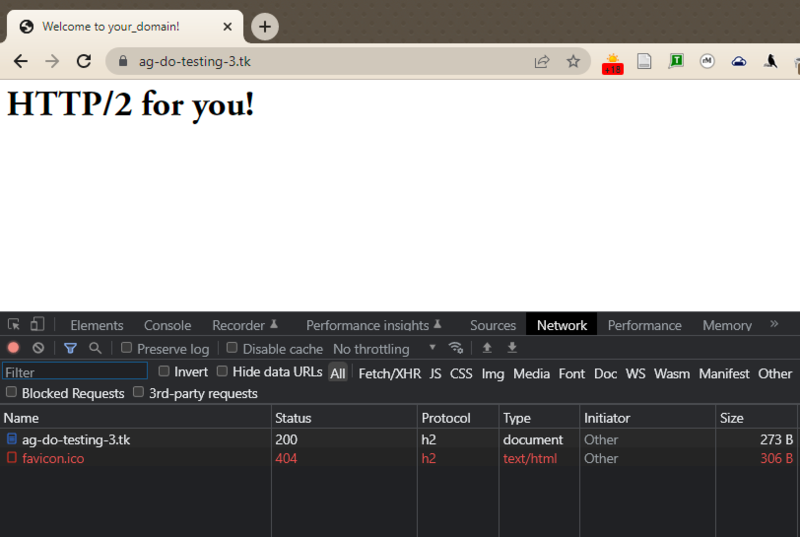 Open the Chrome Developer Tools (View -> Developer -> Developer Tools) and reload the page (View -> Reload This Page). Navigate to the Network tab, right-click on the table header row that starts with Name, and select the Protocol option from the popup menu. You'll see h2 (which stands for HTTP/2) in a new Protocol column, indicating that HTTP/2 is working. At this point, you're ready to serve content through the HTTP/2 protocol. Let's improve security and performance by enabling HSTS. Even though your HTTP requests redirect to HTTPS, you can enable HTTP Strict Transport Security (HSTS) to avoid having to do those redirects. If the browser finds an HSTS header, it will not try to connect to the server via regular HTTP again for a given time period. No matter what, it will exchange data using only encrypted HTTPS connection. This header also protects us from protocol downgrade attacks. The max-age is set in seconds. The value 15768000 is equivalent to 6 months. Save the file, and exit the editor. Finally, restart the Nginx server to apply the changes. Your Nginx server is now serving HTTP/2 pages. If you want to test the strength of your SSL connection, please visit Qualys SSL Lab and run a test against your server. If everything is configured properly, you should get an A+ mark for security.